Reason for Stay: Syncope and Collapse. How did this patient hear about Palmetto Subacute Care Center? The Social Worker from Kendall Regional Hospital. Maria is an 88-year-old female who arrived at the emergency room, stating that she just felt “bad.” She had some difficulty expanding upon this, but clarified by saying she had generalized weakness and fatigue. She denied focal weakness, numbness, fever, shortness of breath, abdominal pain, and urinary symptoms. Maria was eventually discharged from the hospital; however, according to Maria’s son, Maria had a syncope episode around the time of discharge and was readmitted for acute care. 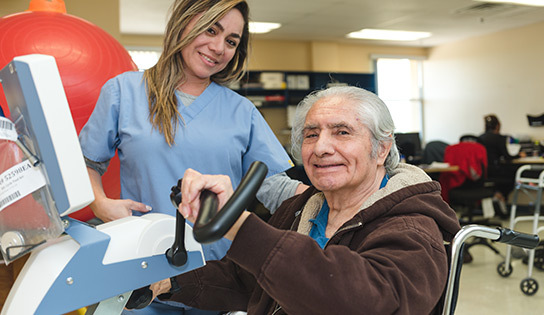 Her doctor recommended physical therapy for roughly 30 days before returning home, thus Marisa sought therapy and skilled nursing services here at Palmetto. Maria’s journey began on November 05, 2018. When she arrived to our community, she was greeted by our interdisciplinary team through a warm signature welcome. Upon arrival, she was very weak and was unable to walk steadily and perform everyday living activities. On her second day here at Palmetto, Maria was evaluated by the occupational and physical therapy teams to set a personalized plan of care in place to begin her healing journey. Throughout her stay, Maria also received frequent chest x-rays as ordered by her attending cardiologist. Maria received both types of therapy, five times a week, for four weeks. Occupational therapy focused on ADL’s, consisting of re-training coordination, safety, balance, therapeutic activities, and patient caregiver education. Physical therapy focused on bed mobility, transfer, gait training, therapeutic exercises, balance, endurance, and safety skill instructions. Maria worked diligently and trusted the team here at Palmetto. From keeping her belongings safe, to making sure that she was receiving the best care, the Palmetto staff were proud to be a part of her journey. Maria was discharged home as planned. We made sure that she was all set and ready, from medication education to transportation, we made sure that Maria had the right tools to have a successful return home. Maria and her son were extremely happy with the care provided to Maria at Palmetto.